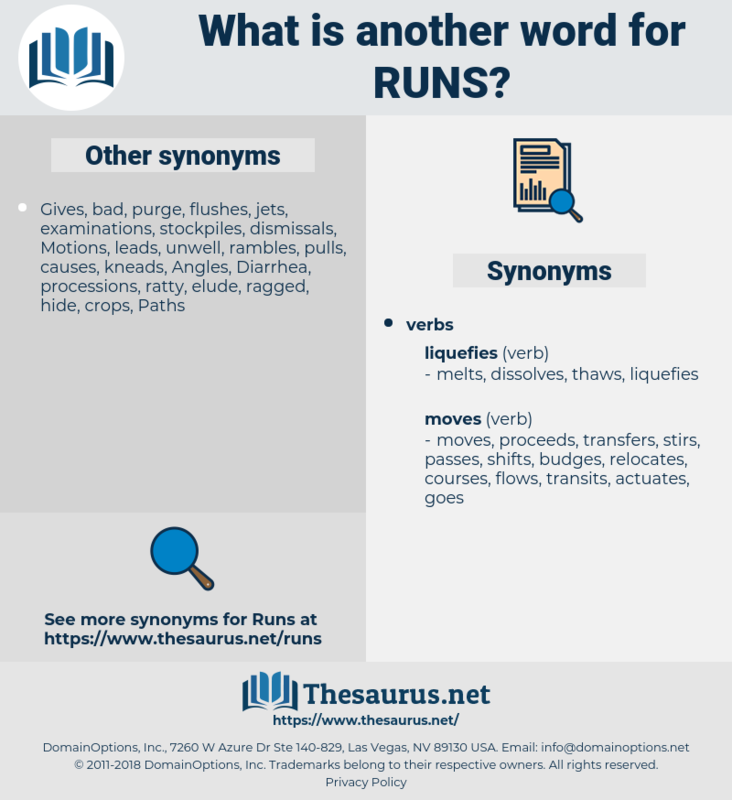 What is another word for runs? turns, enables, activates, requires, flowing, activate, enable, sinks, activa, execute. undertakes, provisions, Opportunities, subparagraphs, disbursements, operations, subregions, appearances, rounds, backgrounds, operates, issues, circulations, assassinations, returns, justifications, withdrawal, withdrawals, Possibilities, penetrations, implements, accommodations, conducts, Suggestions, accomplished, changeovers, departures, Journeys, printings, mountains, gutters, winnings, rangelands, explosions, retirements, sounds, increases, tunnels, references, maintains, parcours, experiments, airstrips, coulees, companionways, quotations, roadmaps, consignments, Deliveries, threads, minutes, expressions, Trajectories, datasets, experiences, Killings, Referrals, movement, Movements, portions, crossing, crossings, divisions, outings, wordings, clusters, locations, hours, displacement, displacements, shortages, parts, corridors, Entries, channels, instalments, collectors, respects, Rotations, bundles, rings, tours, staircases, insights, passports, Analyses, proceeds, patterns, pointers, directions, discharges, circuits, outdoor, triggers, enclaves, raffles, campaigns, shipments, stairs, Shots, passageways, transfers, advances, fulfils, extracts, auditions, done, performers, fishways, chains, scrambles, moves, collections, stairways, segments, transits, arms, credits, times, versions, starts, venues, stripes, deletions, routes, passwords, sequences, actively, prints, sub-items, avenues, stretches, breaths, contests, careers, stands, excerpts, Dummies, supplies, objectives, pursuits, topics, prizes, periods, pairs, Histories, steps, sections, Groceries, removals, rises, shuttles, rides, spots, Studies, marks, tricks, ladders, points, PATHWAYS, looks, Stories, parcels, flights, assets, strongly, travel, Travels, seems, na, ways, raids, instances, ranges, Branches, pieces, options, sorties, passages, castings, trains, CENTS, actions, shits, walkways, voyages, Panics, degrees, strips, approaches, lots, intakes, suites, phrases, Recalls, agendas, scores, Whether, quotes, be, switches, markers, packages, targets, Ones, FARES, bicycles, inlets, events, Horses, roads, pilots, serials, railways, stitches, Essays, being, paragraphs, legs, testing, knees, Testes, assists, loads, Angles, acts, Distances, batches, machines, PORTS, streams, drawings, exits, feels, fades, outlets, aisles, shifts, shares, leaks, hints, crowds, outputs, grades, bits, pistes, slices, Ponies, plots, stops, visits, Hauls, trials, transcripts, stages, cycle, cycles, assays, clues, draws, guys, buses, bikes, attempts, sheets, bins, test, Tests, Dies, Ideas, spans, SLOPES, levels, shall, Goals, wishes, Does, Phases, blocks, is, stools, places, holds, dots, aims, Tracks, Cues, items, texts, LANES, tips, turns, trails, Copies, tries, Has, come, Classes, waves, dogs, east, est, shops, Paths, cases, sets, keeps, dates, Downs, enables, activates, requires, activate, LINEs, sinks, Cas, makes. shuns, rules, turn, surrender, runways, undermines, incurs, encounters, underlies, communicates, undergoes, participates, administrates, constitutes, distributes, january, considers, intervenes, incorporates, governs, circulates, organises, launches, contradicts, illustrates, inspires, progresses, represents, requisition, terminates, organizes, duration, arranges, supervises, introduces, ensures, penetrates, exists, implement, contributes, presents, disseminates, articulates, presupposes, orchestrates, undertakes, suggests, sponsors, delivers, transcends, funnels, stipulates, supports, threatens, ensues, features, hangs, generates, mounts, publishes, infringes, overturns, unfolds, harnesses, forwards, corresponds, curates, enforces, summarizes, jeopardises, acknowledges, conflicts, regulates, transitions, occurs, haunts, originates, coordinated, coordinates, meanders, management, offers, examines, commences, surpasses, competition, converts, concludes, determines, sustains, Addresses, initiates, appears, suffers, utilizes, confronts, elaborates, proposes, counts, describes, encompasses, location, transmits, outlines, facilitates, amounts, broadcasts, consults, fulfills, pertains, formulates, culminates, leverages, endorses, prescribes, recognizes, complicates, traverses, spearheads, centers, dispenses, includes, oversees, breaches, Amongst, utilises, squirts, responds, harbours, enters, presides, engages, broadens, persists, Records, animates, refers, commissioning, installs, involves, expires, assures, rotates, continues, pursues, captures, rescues, emerges, releases, steers, convenes, identifies, waivers, accrues, monitoring, monitors, challenges, navigates, belongs, diffuses, sends, exploited, exploits, submits, breaks, drains, revolves, serves, severs, Violates, incites, caters, argues, highlights, instinct, ranks, deserves, begins, exempts, coincides, Leaves, Entailed, entails, comprises, command, commands, prompts, opens, disposes, harvests, accounts, varies, relieves, asserts, driver, ends, behaves, occupies, expresses, contends, depends, remains, absconds, conveys, brings, handles, promotes, produces, reflects, propels, period, establishes, emphasizes, finishes, succeeds, flies, secures, offends, parallels, realises, assembles, extends, straddles, insists, treats, assumes, spreads, expands, affords, Carries, arrives, consists, operates, possessed, possesses, wears, issues, derives, collides, specifies, intends, knock, knocks, crawls, Risks, arises, connects, conceals, compromises, realizes, follows, pushes, Affects, defines, directing, directs, develops, resides, flees, enjoys, poses, happens, exposes, IEADS, registers, dictates, crosses, contains, equates, sings, binds, rolls, relates, tackles, Strikes, Exercises, retains, twists, fires, accuses, spends, becomes, displays, implements, needs, boasts, guides, employs, dashes, attends, Charges, compels, vertical, control, controls, exhibits, embraces, conducts, checks, imposes, implies, Houses, creates, preserves, scrolls, alleges, elapses, slides, sticks, chairs, jumps, sweeps, batch, Journeys, SITS, resorts, errands, farms, aligns, owns, exceeds, causes, attains, Bears, equals, lies, covers, throws, receives, between, tends, embodies, chases, Focuses, focusses, sounds, raises, increases, links, processes, hinges, Plays, trial, builds, deals, dodges, maintains, plus, attaches, bids, parcours, quits, den, suits, relies, joins, goes, consignments, drops, lasts, puts, cares, obtains, accepts, sees, stays, achieves, lacks, experiences, level, whip, crossings, hits, matches, falls, spins, adopts, applies, reaches, Rests, shows, Gives, place, yields, kills, says, okay, hosts, tours, totals, proceeds, tosses, Faces, directions, beats, heads, seeks, stems, takes, lags, transfers, blames, fails, save, saves, fulfils, pits, ties, moves, Backs, starts, routes, Comes, adds, reads, stretches, pays, stands, fits, means, rises, asks, marks, points, PATHWAYS, looks, closes, Travels, wants, seems, logs, ranges, passages, approaches, lots, will, switches, packages, targets, paragraphs, 24, assists, V, acts, streams, feels, shifts, good, meeting, meets, stops, visits, cuts, trials, stages, cycles, assays, draws, guys, ai, attempts, Tests, spans, gets, wishes, flows, Does, is, places, holds, aims, Tracks, items, turns, trails, tries, Has, sets, keeps, dates, requires, sinks, makes. performances, errands, series, Races, lengths. Dey tells me dat de healin' pains mos' gen'rally runs into de min'. Well I never, said I, the boy runs away without money, without a cap, without a piece of bread in his pocket. 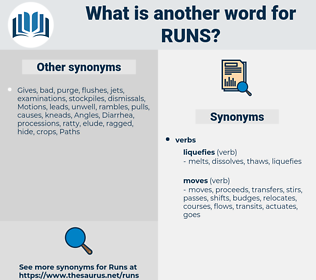 romania, re-arm, rana, ramie, rerun, roumanian, Rheumy, romany, rain, roam, roan, rimy, runyon, reno, rummy, rhyme, rheum, ron, room, renin, rainy, rama, rein in, rim, runway, rhenium, run on, rumen, romeo, roomy, rhone, rowan, riemann, rhinion, reunion, rayon, rein, remain, rimu, romneya, roma, rom, ram, rem, rue anemone, rumania, romaine, rennin, ramee, roneo, run-in, rum, rime, rna, ruin, runaway, ram home, run away, rommany, Ramayana, ramona, rani, runny, rearm, Rhone Wine, roumania, romanian, run-on, Rhine Wine, rumanian, ream, rhein, roman, romani, rameau, rhine, rima, rhynia, ramman, rename, rome, rune, renown, rhino, renew, riemannian, rn, ranee, roomie.